How bold is this claim: The best new dining hotspot in the Capital Region is that area around the Latham Circle. I mean it. When was the last time you dined there? I bet you opened social media in the last week and found a photo of someone eating in that area. Superior Thai, Chinese, Eastern European, and pub food can all be found just off Exit 6. Now there's halal food, too, with the recent addition of Zaitoon Kitchen, another example of why this spot is becoming a premier local food destination. 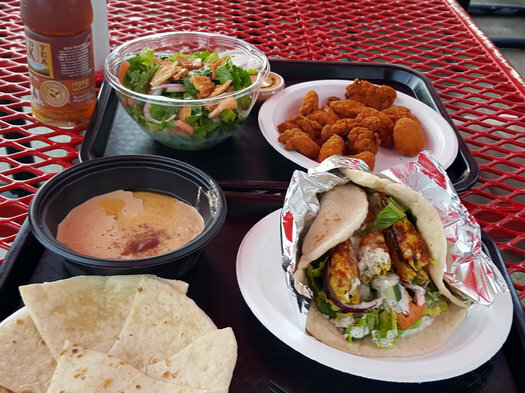 Halal cuisine is nothing new to the area. Schenectady has had a longstanding cache, and Albany's Central Avenue corridor has also experienced an influx of halal-abiding restaurants in the last two years. 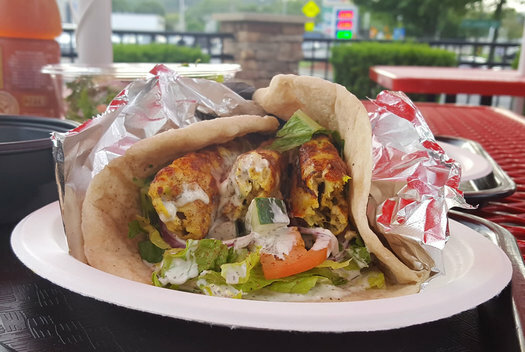 Now Zaitoon Kitchen, which opened earlier this year, is joining the wave of food options in Latham. The Troy-Schenectady Road stretch surely has its share of chain establishments, but tucked among them are also jewels such as Ala Shanghai, and Celadon Thai, and Tipsy Moose. Down the road is Euro Deli or Dnipro. Go just a bit beyond the circle, and you'll find longtime favorites such as Bella Napoli, Saati, and a string of beloved diners. On my first visit, my friend and I tried the ground chicken wrap, made from cage-free halal-approved ground chicken balls (like a kofta), served on a pillowy pita with fresh lettuce and tomato and drizzled with a tangy herb dressing and buttery olive oil ($8). We also tried the wings, a boneless version that comes paired with a creamy white "Spin Sauce" that seems to be a play on classic NYC halal cart white sauce made from mayonnaise, lemon juice, and spices like sumac, turmeric, and cardamom. (It looks like this sauce is being bottled by a local company. More to come.) A zippy oil-based red sauce was also served, relying on cayenne, sumac, and cumin for a peppery, but sweetly floral, kick ($6). Roasted red pepper hummus ($5) is unfussy, made from chickpeas, tahini, garlic, lemon, and salt and served with soft pita wedges. And a fattoush salad of lightly-dressed romaine, tomato, cucumber, and crispy flatbread chips ($4) was more than enough food for two. Have eaten in and picked up food from Zaitoon..the Babganoush is fabulous as is the lamb wrap and the falafel. The dumplings are to die for!! This place is always packed and glad to have them so close to home!!! I'd prefer to have my eyes ripped out than have to endure the quaintness of a night out in Latham....particularly the Latham Circle area! Hell on earth! Hi all! Just following up on Spin Sauce. Yes, it's a local product, made by the cousin of the owner of Zaitoon Kitchen. (Props to Roni, who told me "zaitoon" means "olive" in Arabic.) Spin Sauce is available at area Price Choppers and will also be the focus for the menu at a new UAlbany restaurant (from the Spin Sauce owner) called Halal Shack opening this fall. Mediterranean/Halal food has officially jumped the shark in Albany. There is one on every nearly every corner now. It reminds me of the sushi invasion of several years ago. And while Zaitoon is new, their cuisine is hardly novel. The food here is total trash. So expensive! Not real Afghan food! When you eat real Afghan rice it has a flavor. Go to Afghan Kabab Express on Central Ave instead people.